Made with real ingredients like pasteurised eggs, soyabean oil and vinegar, just like the traditional recipe. Mayonnaise is a key ingredient and it needs to taste authentic and bind well for my dish to succeed. Soybean Oil, Eggs, Sugar, Salt, Acetic Acid, Permitted Acidity Regulator, Permitted Edible Gum, Permitted Preservative, Permitted Flavouring (Contains Mustard and Peanut), Permitted Calcium Disodium EDTA. May contain traces of cereals containing gluten, soy, fish, and milk. *Footnote: Source Euromonitor International Limited; Packaged Foods 2018 edition, retail value sales, umbrella brand classification (includes all Hellmann’s and Best Foods brand sales) 2017 data. 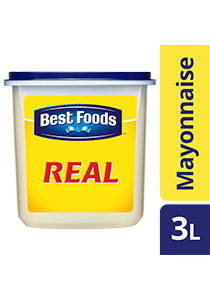 Best Foods Real Mayonnaise is your preferred mayonnaise that delivers a delicious balanced taste, with the right creamy texture and consistency. Made with real pasteurised eggs, vinegar and soybean oil, it’s ideal for various applications such as a base for elaborated cold sauces, salad dressings, sandwich spreads and dips. Best Foods Real Mayonnaise, the best choice for all your recipes! Keep in a cool & dry place. After opening, keep refrigerated at 4–10°C. Do not freeze.